Like any other culture in the world, the pondering culture has its own mythology, which has grown and matured over the years. However, just because our ancestors always thought it was true, doesn’t necessarily make it true. Here, 20 “old-wives tales” are examined and the facts set straight … once and for all. 1. Predators will eat all of the fish! There is a constant fear in the water gardening community that raccoons and other four-legged predators will go swimming in your pond, and while they’re in there, they’ll help themselves to some of your prize Koi, Shubunkin, or goldfish. When you go out to your pond in the morning and discover you’re missing a fish or two, it’s very tempting to blame in on such critters, especially if you didn’t see it happen. There has to be a reasonable explanation, and predators are as good as any, right? However, take the following facts into consideration before you jump to any conclusions. Raccoons generally won’t swim. That’s not to say they never swim, or couldn’t stand on the side of your pond and take a paw swipe or two at your fish. Fortunately, most fish will swim to a deeper, more protected part of the pond when a predator is threatening them. The one predator with legitimate credentials is the Blue Heron. These tall, long-legged, big-beaked birds can easily wade into your pond, help themselves to any fish they think look tasty, and fly away with their bellies full. They are a protected species, so they are off-limits if you’re thinking about taking revenge on them. However, a scarecrow, a motion-sensing sprinkler that can be set up alongside your pond, ready to fire a steady stream of water at a heron, has had some degree of success in warding off these curious critters. It’s a good idea to move the sprinkler often, though, to keep them guessing. Giving your fish a place to hide dramatically helps their odds of survival. Plenty of lily pads given them some protection and will work to minimize attracting a heron in the first place. Other protection measures include a cave-like structure that can be built in during the pond’s excavation, or if you already have a pond, they can be added with a little pond remodeling. Rocks are essential in creating these hiding places in your pond. Crevices, or miniature caves, can be created within the rock walls of your pond. The possibility of pond predators seeking out your pond is, indeed, a valid concern in terms of the safety of your pond’s inhabitants, but the possibility shouldn’t be a reason to avoid building a pond. 2. The presence of rocks and gravel make it difficult to clean a pond. You are susceptible to buying into this myth if, and only if, you’ve never experienced pondering with rocks and gravel in your pond. if you have a smooth-bottom pond, and each season you’re amazed at the amount of muck and grime that collects on the bottom, you automatically rule out rocks as a solution. You keep visualizing that same amount of muck on top of the rocks and gravel and say, “NO!” to even considering them. ; It’s understandable. it seems logical . . . until you learn the rest of the story. Rocks and gravel offer a natural place for aerobic bacteria to colonize and set up housekeeping. this bacteria breaks down the fish waste and debris that would otherwise accumulate in the pond and turn into sludge. Regardless of your pond’s location (i.e., close to trees and loads of leaves), or how many fish you have in it, you’ll find that having rocks and gravel in your pond not only makes it look better, but it makes it healthier, as well. So, contrary to the myth, having rocks and gravel on the bottom of your pond actually allows Mother Nature to clean up after herself, saving you headaches and hours of work trying to keep the bottom of your pond muck-free. 3. UV lights such as those in the UltraKlear™ UVC are the best way to keep pond water clear. UV clarifies are one of the ways to keep your pond water clear, but certainly not the only way, and arguably not the natural way. The fact of the matter is that if you have a pond that’s naturally balanced, in which the aquatic circle of life is rotating the way that Mother Nature intended, you don’t need UVC at all. In this naturalistic setting, the fish eat the plants, then produce waste that gets broken down (along with other pond debris) by aerobic bacteria that’s colonized on the rocks and gravel below, and then it’s taken back up as nutrition by the plants, continuing the cycle. A naturally balance pond is a low maintenance pond because Mother Nature is doing the maintenance work for you. Pretty good deal, don’t you think? There are several drawbacks to the UV solution, though. First, no matter how intense, UV clarifiers don’t affect string algae at all, and so this problem is not addressed. Secondly, after the regular algae is killed, it generally falls to the bottom of the pond, biodegrades, and provides another wave of nutrition for another (often larger) algae bloom. if you’re not careful, it’s easy to encourage larger cycles of algae blooms by using a UVC. If your pond is unbalanced, the choices are minimal. The third, and most obvious drawback is that a UVC isn’t cheap, and the bulbs usually require replacement every season. 4. A pond must be at least three feet deep in order to keep Koi. There are thousands of two-foot deep ponds around the country, full of happy and healthy Koi. A common myth is that ponds must be built at least 3 feet deep, especially if they contain Koi and are located in colder climates. You see, the water in a two-foot deep pond will only freeze eight inches down, even in the coldest of climates, because of the insulating qualities of the earth that surrounds the pond. On the flip side, those of us living in sunny, hot states are concerned about boiling our fish in the summer. Not an issue in a well-built water garden. Between the lily pads and plants, the pond is kept somewhat shaded. If you add a 24/7 circulation system with a waterfall, it cools things even more. No sushi here! A pond that is too deep could be considered a swimming pool by your local government and, therefore, fall under strict guidelines and codes. Also, more digging means more work, more water to fill the pond, and more additives to treat algae and fish illnesses. 5. Koi can’t be kept in a pond that also contains plants. In a naturally balance ecosystem, Koi and plants complement and need one another. In nature, fish feed on plants. As a result, they fish produce waste, which is broken down by aerobic bacteria on the bottom of your pond, which, in turn, is used as fertilizer by the plants to grow and produce more natural fish food. it’s known as the circle of life, and to imply that Koi and plants shouldn’t co-exist is to ignore nature. On the contrary, fish naturally love to eat plants, and most of the time they’ll (the fish) survive nicely without you feeding them at all due to the plants and algae. On the other hand, you have to have a sufficient volume of plants to accommodate the Koi, too. In the naturally balanced pond, proportionality is always a key ingredient to success. 6. Fish have to be brought inside for the winter. Fish do fine during the coldest of winters as long as you give them two feet of water to swim in, oxygenate the water, and keep a hole in the ice with a bubbler, allowing the naturally produced gasses to escape from under the ice. Otherwise, you let Mother Nature do the rest. The fish will spend the entire winter hibernating at the bottom of the pond and then they will slowly wake up as the water warms in the spring. In areas of the country where freezing is not an issue, fish owners simply stop feeding their fish commercial fish food (which is high in protein) while their little digestive systems are dormant during the “winter” months. They can still give them treats like watermelon, zucchini, lettuce, etc., though. 7. Pond water must be tested on a daily basis. This myth comes from the aquarium industry and it has a lot to do with the fact that an aquarium is a much smaller body of water and the small size makes it more difficult to balance. Mother Nature never tests her water, and her ecosystem does just fine. A well conceived, naturally balanced water garden normally requires no testing either. 8. A pond in my yard means that I will have a lot of mosquitoes. Mosquitoes will generally only lay their eggs in still, stagnant water. If the mosquitoes happen to lay eggs in your pond and the mosquito larvae hatch, the fish in your pond will consider them a treat and will pick them off the water’s surface with great enthusiasm. Your skimmer will sweep up whatever the fish miss. In fact, a pond full of hungry fish makes a great defense against the West Nile Virus problems in your neighborhood! 9. A pond cannot be in an area where there are a lot of trees. In nature, ponds and trees go together like ham and eggs on a breakfast table. Yes, you will have more leaves in your pond in the fall, but, by the same token, the shade provided by the tree(s) will help minimize the algae bloom in the summer. Furthermore, if you have a skimmer sucking the top quarter inch of water off the top of your pond, it will pull most of the leaves and related debris into an awaiting net. This takes about 30 seconds to empty, and it can be a daily task in the fall if your pond is close to trees. Add it all up and it’s a trade-off that most full-sun water gardeners would love to have! So, don’t worry about trees and ponds. They’re fine. 10. Koi can’t be in a pond that also has rocks and gravel. Koi are actually just a fancy variety of carp, and all carp are bottom feeders. They love to swim along the bottom and scavenge everything that is available on and in-between the rocks. In nature, it’s not uncommon to find ponds, lakes, or rivers with rocks on the bottom. it’s more like their natural environment than an exposed rubber liner, so why even think about doing battle with Mother Nature? 11. It’s okay to use chemicals in a pond. This one comes from the swimming pool industry. If chlorine is good for humans in the local swimming pool, then chemicals must be okay for fish and the plants in the pond. Products like algaecide (copper sulfate), dechlorinator (sodium thiosulfate), and fish antibiotics are commonly used as quick-fix solutions to balance related problems. In the end, your best bet is to attack the root cause of the problem and make sure that you have a naturally balanced pond that allows Mother Nature to take care of all the maintenance issues. 12. Having a pond may decrease the value of a home! Everyone knows when it comes to the resale value of your home, a swimming pool can be deadly in some areas of the country. On the other hand, especially in the Southwest, pools can add as much as $7-10,000.00 to the value of the home. A well-built water feature will add about $3-4,000.00 to the appraisal. However, with water features becoming more and more popular, you can bet that the demand for them will get even bigger! 13. There are liability or safety concerns associated with a pond! it’s natural to have these thoughts and concerns, but it is important to remember that a professionally-installed water garden has steps leading into the pond. The first shelf is only ankle high once the gravel is laid down. The next shelf is up to your knee, while the smallest area in the bottom is just above your knee, so it is not constructed like a swimming pool. We do recommend that you make your neighbors aware of the water garden and educate your own children and friends about the safety of any body of water. Or, if you prefer, you can have a “pondless” organic water feature that is only inches deep and “disappears.” This is especially terrific for front yard features. 14. A pond should be located in the lowest part of a yard. It makes sense to have your water garden in this area because it already collects water; however, this is probably the worst location for your investment because of the run-off that can creep its way into your pond. Ask yourself this: “Do I really want my pond located on the opposite end of my property? Do I really want to miss the sights, sounds, and interactive nature my pond presents every day?” When it’s positioned near your house, you can take in the beauty and tranquility of your pond when entertaining friends or lounging on your patio or deck. 15. A timer can be used on a pond. Not true! Your pond is a living, breathing ecosystem that needs constant oxygen, just like the human race. If you shut your system down at night, then you can never have sufficient growth of beneficial bacteria to fight algae blooms, and your finned friends will have a hard time breathing. 16. It’s necessary to drain and clean a pond regularly. The reality is, if you fail to set your system up using the five-part recipe so that it’s working in harmony with Mother Nature, then you’ll be asking for a lot of related problems that may require you to drain and clean your pond out on a regular basis. On the other hand, if you decide to work in harmony with Mother Nature instead of doing battle with her, then draining and cleaning your pond should take place only once a year (at most). Clean-outs should occur in the spring, before the weather gets warm and the bacteria has an opportunity to set up. 17. Bottom drains work best if you have Koi. The claim by many Koi keepers is that the water will lack sufficient oxygen at the lower levels, and this insufficiency can be detrimental to your Koi. The real fact is that if you avoid making your pond any deeper than two feet, there is very little difference in the oxygen levels at the surface and at the bottom of the pond. the problem with bottom drains is that they have a tendency to promote leaks, possibly leaving your fish land-locked. now, that’s a problem to avoid at all costs! 18. The more filtration, the better the pond. Believe it or not, you can over-filter a pond. That’s right. Tight filter pads in your skimmer pick up the smallest particles of debris, causing you to be cleaning the filtering mechanism out constantly. Now remember, we’re not talking about drinking water here. What we are talking about is water clarity and water that’s healthy for your fish. Fish in the wild certainly don’t swim around in bottled water. If you can see a dime on the bottom of the pond, then the water clarity is just right for your fish, and filtering past that is overkill and will create headaches, not eliminate them. 19. A person can’t be a Koi hobbyist and a water gardener. Not true! You can raise Koi and have a beautiful water garden. There are Koi hobbyists who have perfectly balanced pond ecosystems with no chemicals, no sterilization, and a nice assortment of plants. The Koi can grow up to be just as beautiful and just as healthy as they are in traditional Koi ponds — and you’ll love them just as much! 20. High tech is the solution to controlling Mother Nature. More than anything else, being observant and learning from Mother Nature is what it takes to be a water gardener. Whatever she does naturally is what you should be doing in your pond. Whatever she doesn’t do is what you should be avoiding in your pond. If there is a golden rule of pondering, it is not to mess with Mother Nature because you’ll lose. In biological terms, a community can be defined as plants and animals interacting with one another in sharing of available resources and restraints in a defined area. An ecosystem encompasses all the parts of this environment, including the living (biotic) plants and animals, and the non-living (abiotic) components, such as water, air, and the sun’s energy. Ponds are ecosystems, in that they play host to a total interrelationship of all organisms in the environment – birds, fish, frogs, plants, and many microscopic organisms. Thus, ponds not only create a natural ecosystem in their defined environment, but they also fit into the community or life cycle of not just one homeowner’s backyard, but of the entire ecological region. Our skimmer unit is the lowest maintenance, most user-friendly design on the market today. It is the only skimmer available with an overflow design, a low maintenance horizontal filer pad and an optional accurate pond level fill valve. The bulkhead fitted overflow allows you to set the pond level exactly, while eliminating pond edge erosion. A horizontal filter design does not prevent water from reaching the pump and burning it out. Unlike imitation vertical mats, which require substantially more maintenance, the water level about the filter mat is always true. This design allows a fill valve to only activate when the pond water level is low, preventing the problem of continuously running fill valves. A spring-loaded mechanical weir can easily be removed to allow more water flow to reach larger pumps, or to be the most effective in spa and swimming pool applications and has problem to hold up to the test of time without deterioration. The skimmer’s high-density polyethylene construction is firm, but flexes during freeze-thaw cycles or shifting earth. It will never crack, unlike rigid fiber-glass designs, which can easily crack over time. The single greatest benefit of the skimmer is how it hides the mechanics of the pond while substantially reducing the pond’s maintenance. Ponds are ecosystems, in that they play host to a total interrelationship of all organisms in the environment – birds, fish, frogs, plants, and many microscopic organisms. Thus, ponds not only create a natural ecosystem in their defined environment, but they also fit into the community or life cycle of not just one homeowner’s back yard, but of the entire ecological region. We began designing plant pockets into our ponds as a way to get rid of unsightly planting containers. Plant pockets, around 6 inches deep and filled with soil. Promote health in plant development by allowing the roots to spread through surrounding gravel, unlike containerized plants, which can quickly become root-bound. A strong 45-mil EPDM liner is the best choice for most pond installations. Unlike concrete, it is easy and inexpensive to install and won’t crack. When covered with stone, it has a 40-year life expectancy. If a leak ever were to occur, a simple inner-tube patch kit can make it as good as new. A woven, needle punched underlayment forms a soft padding for the liner. Unlike newspapers, it’s quick to install. Unlike sand, it completely covers the vertical areas of the pond shelves. And, unlike carpet padding, it allows gases to escape out the sides while looking more professional. Adding rocks and gravel to a pond solves many traditional pond problems. Contrary to popular opinion, adding rocks and gravel reduces pond maintenance. Gravel, unlike a smooth pond liner, provides surface area for bacteria to colonize. Fish waste and other organic matter that settle to the bottom of the pond get broken down by the bacteria living there. Anaerobic sludge is there fore decreased naturally the way nature intended it to be. Additionally, covering the pond liner with gravel protects the liner from harmful UV rays and damage from animals and other sharp objects. The rocks and gravel also help hold down the liner during high ground water conditions and create areas for fish to hide when predators come around. Finally, a stone bottom looks far more natural and is safer to walk on then an exposed slippery rubber liner. The Biofalls® filter revolutionized pond filtration by becoming the first biological filter that, when installed, becomes a waterfall. Its design includes a molded shelf that allows for easy stone placement. This completely camouflages the unit with a multi-media filtration area consisting of three filter pads. Bags for lava rocks and finally, an area for floating or marginal plants, are extremely effective in filtering the water. A new improved molded stone with a ribbed surface twists the water naturally as it flows back towards the pond. There is no need for messy liner tape. The locking snout on the BIOFALLS® filter provides a leak-proof method of attaching the liner to the BIOFALLS® filter. Its high-density polyethylene construction is firm, but flexes during freeze-thaw cycles or shifting earth. It will never crack, unlike rigid fiberglass designs, which can easily crack over time. The single greatest benefit of the BIOFALLS® filter is how much easier and faster it allows you to create beautiful waterfalls! As far north as Zone 4 (MN), Fish like Koi and Goldfish can be successfully kept, and even bred, in water that is only two feet deep. Extreme bacteria naturally balance the pond. Marginal plants can be planted directly in the gravel. Their roots will spread throughout the gravel, cleaning the pond by using nutrients and growing vigorously. An ecological region is made up of thousands of elements, water being the most basic of these. Each pond is a piece of this puzzle. As wild habitats are depleted due to commercial development and other factors, these pieces are eliminated. This is why it is so important to restore and preserve as many of these as possible. A backyard pond restores one of these pieces back to an ecosystem. So don’t just see a pond as an independent, unrelated element. See it instead, as part of the big picture, the regional environment. A regional ecosystem or pond ecosystem can be likened to a triangle. In a regional ecosystem, ponds, streams, and lakes (water) are the base of the triangle. In the pond ecosystem, the water is the base of the triangle. Everything found above the case is completely dependent, either directly or indirectly, on water. Since water is at the base of all this diverse life, let’s take a quick look at the properties of this very important substance and at the some of the major contributors to water chemistry. Why Install A Pondless Waterfall? Are you interested in installing a water feature in your yard, but concerned about the safety and liabilities of having a pond? Or are you apprehensive about taking on the responsibility of maintaining a full-fledged ecosystem? Well, we have the answer for you. 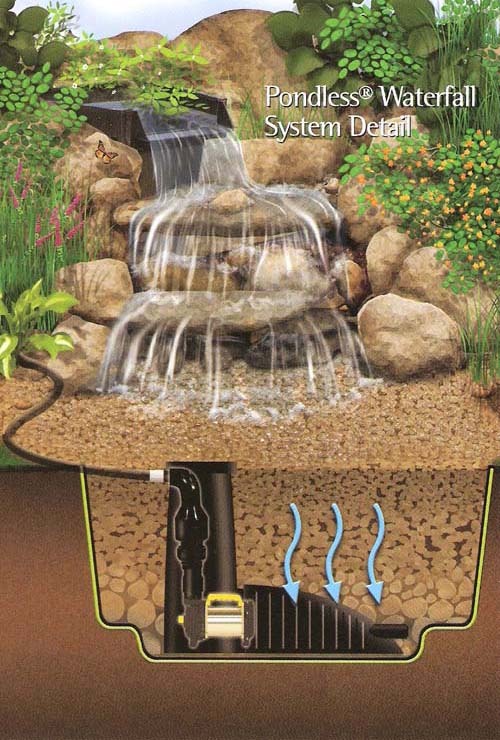 The Pondless® Waterfall is basically that – a waterfall and stream, without the pond. Why is it called a Pondless® Waterfall? Since the water level never pools above the level of the rock and gravel fill, it gives the appearance of a Pondless® Waterfall. A hole, deeper than a normal pond, is dug, then lined and filled with rock, gravel and water. The water is then circulated from beneath the rocks and gravel by a pump that sirs on the bottom. The water runs through a pipe up to a BIOFALLS® filter and down a constructed waterfall and stream, where it falls back into the reservoir. What if I want to add a pond later? 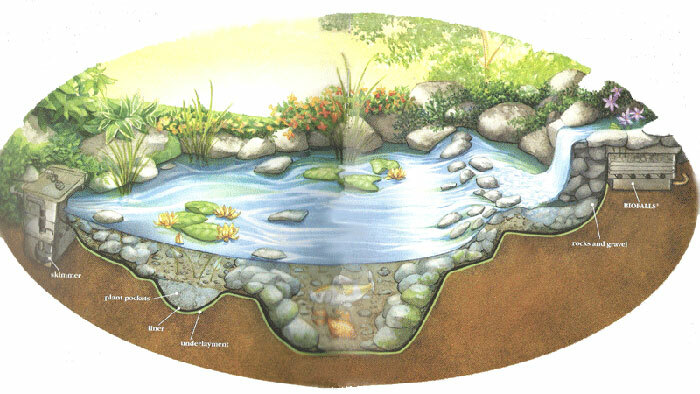 A Pondless® Waterfall is almost a stepping-stone for people who might be interested in a full-fledge pond in the future. If your contractor is resourceful, they’ll make sure they leave enough room for a pond to be added later. How does a Pondless® Waterfall Circulate? The water held within the open spaces of the gravel flows down toward the Centipede™ Module, which is connected to the Snorkel™ Vault. From there, it gets pumped up to the waterfall, where it flows by gravity back down through the gravel bed and Centipede™ Module…and the cycle begins again. Have a water feature dream of your own? Turning water feature dreams into reality. Certified Aquascape Contractors (CAC) are the most qualified and informed pond installers in the water gardening industry. When you choose a CAC you are choosing the best of the best! As water feature artists, we turn the water feature of people’s dreams into a reality. We create ponds, waterfalls and streams that have the look, feel and sounds our customers have always wanted. Our goal on every project is to create the special, sacred spaces of our customer’s dreams. Use a convenient PROJECT FORM to tell us what’s happening. SUBSCRIBE to our newsletter and learn how to manage your brand, and how your customers perceive your business. © Copyright PondscapesAZ 2018. All Rights reserved.